Looking to move your prized pint glass collection or pack away an array of expensive wine glasses? We got you. Instead of wrapping breakables in old newspaper and crossing your fingers, choose moving boxes designed specifically for glasses to ensure your favorite mugs and special stemware make the journey safely. 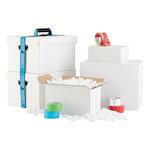 Read on to find out which three box kits we recommend for packing and moving your glassware. Packing up your rarely used wedding china or grandma’s antique tea set? Check out our best boxes for dishes for supplies and tips. The U-Haul Glass Pack Kit is an all-in-one solution to separate and protect glasses and stemware in transit. 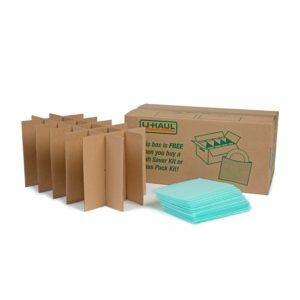 Each kit includes an easy-lift box with handles, eighteen reusable foam pouches, and a divider that assembles to make eighteen packing cells. Unlike other glass pack options, U-Haul’s kit comes with a box—which means there’s one less thing you have to add to your supply list. 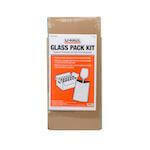 Box durability, reasonable prices, and U-Haul’s return policy make the Glass Pack Kit our top choice. Plus, we’re fans of U-Haul’s customer service and years of moving experience—a free bonus with your purchase. Tap into that expertise, and ask your packing questions when you buy your boxes and supplies. Tend to go nuts on box buying? U-Haul offers a 100% buy-back guarantee on any unused U-Haul boxes (provided you have the receipt) at U-Haul stores nationwide. Already have a box handy for packing glasses? The affordable Duck Brand Glass Kit is for you. This kit bundles together everything you need to keep glasses safe in transit, including corrugated dividers that pop up to protect up to 12 commemorative cocktail glasses or hand-thrown coffee mugs. For extra protection, slip each item into the included foam pouches before placing them in the divider spaces. You can pair this kit with any 16” x 12” x 12” box. 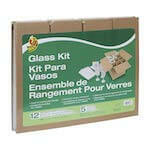 Take note: our recommended box comes in a pack of ten, but the glass kits are sold individually. Know the difference between coupes and flutes? Even if you don’t, you’ll want this kit to protect your fanciest glassware—up to 12 tall pints and stems or 24 shorter rocks glasses. We like the combination of foam sheets that fit right inside the dividers so you don’t need to individually wrap each glass. 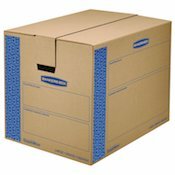 This kit doesn’t come with a box, but it fits best inside The Container Store’s strong and sturdy 16-3/8″ x 12-5/8″ x 12-5/8″ corrugated moving box. Choose boxes with cell dividers. These dividers separate fragile stemware, mugs, and glasses to prevent breakage. 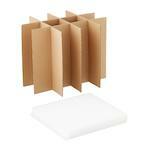 Invest in thick, double-walled corrugated boxes. Sturdy moving boxes for glasses offer an extra layer of protection. Add cushion. Fill the gaps around your glasses with bubble wrap, newspaper, or even old (but clean, please!) clothing. Label it. Words matter. Write “FRAGILE” on all glass boxes to ensure they’re handled with care. Keep glasses snug to prevent breakage. Fill empty spaces with packing paper, air-filled packing pillows, socks, or old t-shirts for full protection in transit. We researched the best moving boxes for glasses so you can focus on other to-do list items. Stick with our picks to safely transport your glasses during your next move. Get the best overall glass-packing experience with U-Haul’s Glass Pack Kit, the best protection from The Container Store’s Glass Storage Kit, and a great deal with Duck Brand’s Glass Kit. Still not sure what else you need for your move? Check our ultimate list of moving supplies to be sure you’re prepared. Whether you’re packing your authentic German beer steins for a cross-country move or toting Grandma Ethel’s china across town, choose moving boxes for glasses to keep your favorites safe in transit. Where did you get your glassware boxes? Share in the comments below to help our readers with their next move.